Microbiome, a term coined by Joshua Lederberg in 2001, refers to the totality of microbes and collective genetic material present in or on the human body. In 2012, the Human Microbiome Project (HMP) found that, by far, the most populous inhabitants of the human body are not human cells, but rather microbes. The human body has ten times as many microbial cells as human cells; they constitute 1–3 percent of a human’s total body mass, some 2–6 pounds (0.9–2.7 kilograms). Moreover, whereas the human genome has 22,000 protein-coding genes, bacteria have 360 times more (about eight million). Completion of the Human Genome Project in 2006, which sequenced the entire human genome, provided researchers with a basis to differentiate human and microbial genes. In 2008, the US National Institutes of Health launched the HMP, a five-year study to assess the nature of the microbial population of the healthy human body, establish a reference database, and determine whether changes or differences in these populations predispose individuals to disease. Scientists found some 10,000 microbial species—mostly bacteria, but also protozoa, yeasts, and viruses—and as of June 2012, identified 81–99 percent of these. The largest numbers of microbes are found on or in the skin, the genital area, the mouth, and, in particular, the intestines. Not surprisingly, populations of microbes are most alike in similar body locales. The microbial composition was found to change over time and is influenced by, among other factors, disease and medications—in particular, antibiotics. Earlier identification of microbes involved their labor-intensive isolation and growth on cultures. The HMP utilized DNA sequencing machines and computer analysis of the genome sequences using bacterial ribosomal RNA (16S rRNA), uniquely found in bacteria, and in phylogenetic studies to classify and identify microbes. It was long believed that the human body maintained normal health independently and that microbes were responsible for infectious disorders. It is now recognized that some microbes play an indispensible role in our digestion and absorption of many nutrients, in addition to being responsible for the synthesis of some vitamins and natural anti-inflammatory substances, and the metabolism of drugs and other foreign chemicals. SEE ALSO: Ecological Interractions (1859), Probiotics (1907), Antibiotics (1928), Genomics (1986), Human Genome Project (2003). 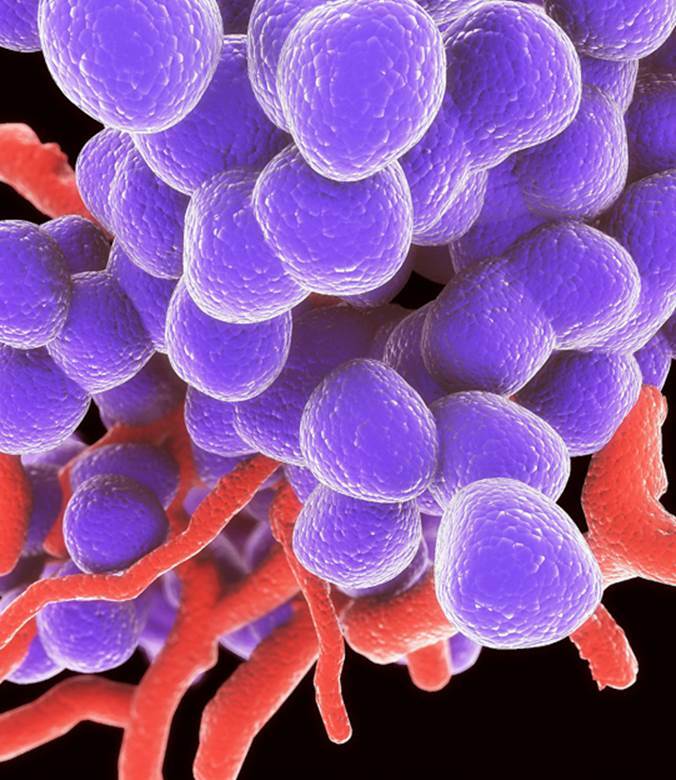 Enterococci (shown, colorized) are normal residents in the intestines of humans and animals but are also responsible for causing serious infections, particularly in hospital settings. Of greatest concern is that enterococci have natural or acquired resistance to multiple antibiotics.